What is the G-Invoicing Initiative? A platform for Federal Program Agencies to conduct IGT Buy/Sell transactions. G-Invoicing facilitates exchange of information between trading partners to negotiate agreements or General Terms and Conditions (GT&C), broker orders, exchange performance information, and validate settlement requests through IPAC. How does my Agency benefit from G-Invoicing? What is the Target Audience for G-Invoicing? Any Federal Agency which conducts IGT Buy/Sell transactions. More specifically any agency that currently uses IPAC for settlement of Buy/Sell transactions with Trading Partners. Is Department of Defense the primary audience for G-Invoicing? No. G-Invoicing is a governmentwide solution. Is the usage of G-Invoicing for IGT Buy/Sell mandated? Yes. Volume I, Bulletin No. 2018-10: Implementing G-Invoicing was published 9/20/2018. This Bulletin outlines the requirements and guidance for Federal Program Agencies to implement G-Invoicing by June 30, 2021. Under what Authority is Treasury Mandating G-Invoicing? What does this mean for my existing Trading Partner Agreements or Orders with open balances? All Agencies are required to conduct IGT Buy/Sell in G-Invoicing no later than June 30, 2021. Agencies should begin transition planning and identifying Agreements or Orders that will be affected by the transition to G-Invoicing with their Trading Partners. Treasury will assist agencies in planning for the transition and implementation of G-Invoicing. What is the timeline for the Governmentwide rollout of G-Invoicing? The current release in the production environment is G-Invoicing r2.1. G-Invoicing r2.1 supports trading partner ability to broker GT&Cs. Orders functionality will be introduced in r2.2 (Feb 2019). Future G-Invoicing enhancements can be found on the G-Invoicing roadmap. I already have Financial Management or ERP systems in place to support my agency IGT Buy/Sell processes. G-Invoicing will not replace individual agency Financial Management or ERP systems. G-Invoicing will serve as the information broker or conduit for your agency to send IGT Buy/Sell transactional data to your trading partner. G-Invoicing includes a number of webservices to facilitate the transfer of data between trading partner systems. What if my Agency IGT Buy/Sell process is manual/paper based or does not have Financial Management or ERP systems in place to support my agency? G-Invoicing includes a User Interface which agencies may opt to utilize for manual data entry. How does Treasury collect requirements for G-Invoicing development? Treasury facilitates and supports a number of governmentwide workgroups to solicit, review, and discuss G-Invoicing requirements. The Intragovernmental Transaction Working Group (ITWG), and Financial Management Standards Committee (FMSC) Subgroups are forums used for G-Invoicing. For more information about joining these groups please visit the Fiscal Service G-Invoicing website or send an e-mail to igt@fiscal.treasury.gov. Will I still need to submit IPAC settlement requests once my Trading Partners and I are on G-Invoicing? No. Settlement requests will be triggered by Trading Partner reports of Performance. Detailed Requirements and Data Specifications for Performance and Settlement are in the process of being written; Treasury will socialize details for these items through future ITWG sessions, and FMSC subgroup meetings. What guidance and information has been provided to the Vendor community? Treasury has published information about the G-Invoicing initiative, Federal Intragovernmental Data Standard, G-Invoicing Interface Specifications, and the G-Invoicing System Mapping and Validation Rules on the Fiscal Service G-Invoicing website. Additionally, commercial vendors have been invited to participate in Financial Management Standards Committee (FMSC) Subgroups to discuss G-Invoicing and to assist with vendor development planning. Federal Agencies are encouraged to contact their FM / ERP vendors and discuss the approach to supporting the mandated G-Invoicing initiative. If your agency maintains GOTS developed software and would like more information, please contact igt@fiscal.treasury.gov. Will G-Invoicing support Trading Partner reports of Receipt and Acceptance? Trading partners will be able to report “performance type” including receipt and acceptance with G-Invoicing r2.3. Buyers or Requesting Agencies will be able to report “Received” and “Acceptance”. Sellers or Servicing Agencies will be able to report “Shipped”, “Estimated Delivery”, and “Delivered”. Can the Agreement Start Date be backdated? Does the start date need to be the date the user is entering the agreement, or can the date be in the future? Users are able to enter dates prior to the entry date. For example, the user may enter a start date of 11/01/2017 if they are creating the GT&C on 11/10/2017. The user is also able to enter a GT&C date in the future; however, the GT&C cannot be approved until that future date. Why is the ALC included in the GT&C data elements while it is currently on the 7600B form? This is due to the current functionality of G-Invoicing that requires you to enter the ALC during the GT&C process before an order can be generated. Can a GT&C be established between more than two Agencies? As noted in the TFM, Buy/Sell activity is reimbursable activity in which goods and services are transferred between two Federal Program Agencies. Additionally, a GT&C provides support for settlement which occurs between two ALCs. The requesting agency ALC and servicing agency ALC must be specified on the GT&C as well as the order. How can an agency get their documents through G-Invoicing when their Trading Partner never signs them? Treasury is mandating the use of G-Invoicing for lifecycle IGT Buy/Sell activity. All Federal Program Agencies that conduct IGT Buy/Sell are required to use G-Invoicing. As the date for compliance is approached Treasury will implement measures to enforce the requirement for IPAC settlement requests to reference G-Invoicing Orders. Why is Assisted Acquisition not currently supported by G-Invoicing? G-Invoicing will be updated with R2.2 to support Assisted Acquisition. Trading Partners will be able to select whether or not Assisted Acquisitions will be included on the GT&C. Additionally, Trading Partners will be able to identify orders that are related to assisted acquisition orders activity. Data elements associated with Assisted Acquisition can be found in the FIDS posted on the Fiscal Service website. What kind of assurance will we have that an IPAC settlement request validated by G-Invoicing can be posted that same day? Our agency wants to know when cash has been recorded. Like today, all settlement requests will appear in the agency's CARS Account Statement on the following business day. At the end of each day, the payments will be validated through SAM and posted in CARS by the following business day. You can view the Document Reference Number from each IPAC in the CARS Account Statement details to ensure that cash has been properly recorded. Also, you’ll still have access to the same IPAC Reports you currently use for cash reconciliations within the IPAC website. IPAC settlement will occur on the combination of Transaction Date and FOB Point. Depending upon the FOB Point chosen at the Order, the Transaction Date will match the Accomplished Date in the IPAC. What is the chargeback process in G-Invoicing? When all trading partners are in G-Invoicing, chargebacks/refunds/adjustments will be handled by adjusting reported performance. Details and Data Specifications for Performance and Settlement are in the process of being written; Treasury will socialize details for these items through future ITWG sessions, and FMSC subgroup meetings. If an IPAC is processed after the order’s Period of Performance is over, what will happen to the invoice in G-Invoicing? Settlement may occur beyond an Order’s Period of Performance. The Performance transaction will tie the payment/collection back to the referenced Order and the Order will be updated to reflect that fund settlement. Remittance advice download will be available for agency consumption out of the GINV application. The settlement can be processed outside of the order's period of performance. However, the settlement request must fall within the allowable time for the TAS (up to 5 years). If the Settlement passes all the validations, G-Invoicing will update order balance information. Details and Data Specifications for Performance and Settlement are in the process of being written; Treasury will socialize details for these items through future ITWG sessions, and FMSC subgroup meetings. Can you send orders within an organization such as trading services or goods within a Department or Bureau in G-Invoicing? G-Invoicing and IPAC support both Intra-ALC and Intra-TAS trading. Users will be required to create Agreements and Orders with the appropriate ALC, Organizational Filters, and TAS information. Can you see all the modifications and/or changes to Documents in G-Invoicing? In G-Invoicing the audit trail history captures and displays the user name and the date that the modification/changes were entered. However, G-Invoicing does not track changes made to each field in the documents. If a document is modified users with access will be notified that a change was made to the document. What information is provided on G-Invoicing notifications? Can electronic notifications be modified by each entity? Users with appropriate roles and data access are notified by email when documents they have access to are created, changed, or require action. Some document identification information is provided in the email notification. These notifications cannot be modified by agencies. How will Classified Data be processed in G-Invoicing? All government agencies must work to protect the integrity of Classified Data. Just like the current IPAC functionality, Classified Data should not be included with G-Invoicing information. This includes any Miscellaneous, Description, or Custom fields, as the data will be retained within the web portal. Can G-Invoicing balances be used to reconcile remaining balances on orders/obligations? The agency's accounting system will be the official source of record for order balances. Users will be able to see remaining balances, but should not use G-Invoicing as the source of record to reconcile total orders, etc. The agency's accounting system will still be the definitive source for financial reporting, Purchase Order reconciliations, ADA monitoring, etc. Transaction events could change in obligations throughout the day, which may not be updated or refreshed in G-Invoicing. What about Grants, Pensions, and Loans? Will these sorts of payments be included in the G-Invoicing Solution? Only Interagency Buy/Sell transactions between agencies will be a part of the G-Invoicing solution. Other payment types such as grants, pensions, and loans will not be impacted and will continue to be processed through IPAC. Will historical IPAC transaction data (transactions prior to the implementation of G-Invoicing) still be accessible in the same format in G-Invoicing? Yes, historical IPAC transaction data of all transactions originated prior to the implementation of G-Invoicing will still be accessible in legacy IPAC. Users may continue to query and download data from the IPAC Transaction Download Report. Is there a copy and paste functionality for G-Invoicing? The user is able to copy and paste into other G-Invoicing fields. How can you copy GT&Cs to re-use and modify only what is necessary? Unfortunately, there is currently no “copy” functionality to paste or re-load applicable data items from a previous document. A user will have to manually enter data into a new GT&C within the system. This is a change request in consideration for future enhancement. How do I initiate the onboarding process for my agency? Contact the Fiscal Service G-Invoicing team at IGT@fiscal.treasury.gov. Onboarding is the beginning to end process that brings an agency into G-Invoicing. Throughout the process agencies: establish a timeline for implementation; form their project teams; map internal IGT Buy/Sell data and processes to the Federal Intragovernmental Data Standards and G-Invoicing processes; test G-Invoicing in a QA environment; establish and configure production accounts; and finally begin entering agreement data into the production environment. Are there resources to support my agency through onboarding? Yes, Outreach and the Agency Implementation will support G-Invoicing adoption throughout the onboarding process. Each Agency will be assigned POCs from Fiscal Service and the Federal Reserve Bank of St. Louis to guide them through the process. Who from our organization should be involved in our G-Invoicing implementation? The buy/sell process involves people from across agency’s workforce, including agreements managers, acquisitions personnel, and financial management/IPAC personnel. What can our agency be working on as we begin onboarding? For your agency’s reimbursable transactions, you can work on identifying the internal systems involved, gathering process documentation, and identifying appropriate subject matter experts. There are user guides, CBTs, remote webinars, and in classroom training in Crystal City Virginia. All training options are available on the Fiscal Service G-Invoicing website. Does my agency need to complete an agreement with Treasury to onboard to G-Invoicing? The agency will be required to complete a G-Invoicing System Enrollment Form. This form will identify the basic agency information as well as key agency POCs (Agency Approver and Primary User Admin). Additionally, the enrollment form contains standard language, roles, and responsibilities that agency will need to agree to before they can access the application. What if my agency has unique processes or data requirements that do not seem to fit within G-Invoicing? Agency specific data requirements and elements or processes should be identified throughout Data and Process mapping. These items should be highlighted to the G-Invoicing team members supporting your onboarding. You should contact your trading partner to discuss G-Invoicing adoption timelines. All Agencies are required to use G-Invoicing for IGT Buy/Sell transactions no later than June 30, 2021. As part of this mandate Agencies are required to submit implementation plans to Treasury by May 2019. Agencies should discuss G-Invoicing adoption with their trading partners while developing their own implementation plans. For more information about the mandate or G-Invoicing related workgroups please contact Fiscal Service igt@fiscal.treasury.gov. Where can I find the G-Invoicing Trading Partner Directory to see what agencies/organizations have their own accounts in G-Invoicing? Does this require my agency to immediately become a TAS/BETC Reporter? Will my agency be required to sign an agreement with Treasury? No. A formal agreement with Treasury will not be required, however, onboarding agencies will be provided a System Enrollment Form that outlines agency roles and responsibilities, identifies primary points of contact, and captures information used to generate agency G-Invoicing accounts. How much does using G-Invoicing cost? G-Invoicing is provided to agencies free of cost. However, Agencies will be responsible for budgeting for the costs associated with implementing G-Invoicing. Is my agency required to interface with G-Invoicing? No. Agencies may choose to leverage G-Invoicing interfaces or the G-Invoicing User Interface for data entry, retrieval, and exchange. However, agencies are encouraged to leverage the G-Invoicing interfaces through their FM and ERP systems. The Treasury web site certificates must be installed to be able to successfully access the QA environment. The certificates can be obtained by contacting the Treasury Support Center e-mail: GInvoicing@stls.frb.org and/or phone: (877)-440-9476. I received the error “You do not have permission to view this page” after attempting to login to G-Invoicing. You may not have permissions to that specific module or forgot to log all the way off and didn’t restart your browser. If you close all the instances of your browser and are still getting this error, then the account you are trying to use you do not have permission to get into that portion of G-Invoicing. Please contact your agency’s G-Invoicing Administrator to update/verify your access in G-Invoicing. I cannot find or see certain GT&Cs (Agreements) I should have access to. Menu options are missing from the Intra-Gov Disburser (Agency) Module. Check with your agency’s G-Invoicing Administrator to ensure that the User ID in question has the proper roles/groups in the Disburser Administrator (Agency) Module. How do I get access to G-Invoicing? If your agency/organization has an account in G-Invoicing, please reach out to your agency’s G-Invoicing User Administrator to create you as a user in the system. If your agency/organization does not have an account in G-Invoicing, please reach out to the Agency Implementation Team complete the G-Invoicing System Agency Account Enrollment Form. How do we add new GT&C/agreement personnel in the event someone is out for any reason? Who would update this? Your agency’s G-Invoicing User Administrator would be able to grant additional users access to the Initial and necessary roles. What do we do if there is an agreement executed outside the system? How do we incorporate it into the system? Any agreement executed outside the system can be entered into G-Invoicing by either trading partner. G-Invoicing allows document attachments that can be scanned in and attached to a G-Invoicing agreement, although, there is no way to circumvent redoing signatures on the system agreement to get it entered into G-Invoicing. For example, if an agency advises their users to enter any agreement whose period of performance runs into current FY or later. It falls on the agency to decide what should be entered into the system in regards to past agreements. 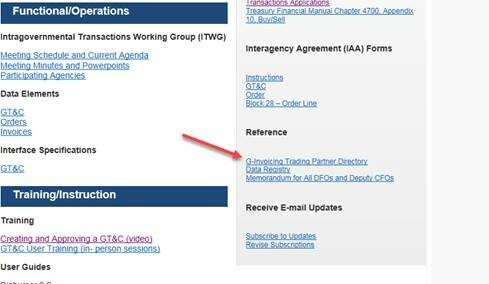 Will users receive an email notice when a document (GT&C/ agreement and/or order) is submitted? G-Invoicing supports email notifications when any document is created, or it changes states. The User Admin activates notifications for users in their profile. For example, when an agreement is created, G-Invoicing will notify all users by email notifications (that are assigned access to that document) that match the created agreement. If the agreement is approved it will again notify everyone that has access to it that the document’s status has been updated. I am receiving the following error: “You may not have sufficient permission and/or data access to perform this operation. Please contact you agency administrator”. Please work with your agency’s G-Invoicing User Administrator to get you added to the appropriate level of access to perform that function. Our agency just on boarded to G-Invoicing and we are ready to input GT&Cs. Are we able to get them approved in the system? If your trading partner is also on G-Invoicing, you can work with them to move the GT&C into an “Open for Orders” status. If your Trading Partners’ ALC is in the Trading Partner Queue, the document can only get to a status of “Shared Draft”. Once on boarded, those documents in Shared Draft will be available to your trading partner to move through the rest of the GT&C process. Is there a limit for number of attachments at the GT&C level? The maximum number of attachments for each GT&C is 25, while the size limit for text and .xml files is 10 MB and for RAR and ZIP is 50 MB. Note: FPAs integrating through an ERP should refer to their vendor specifications for attachment limitations for your ERP software. Can JPEG documents be attached to reports in G-Invoicing? JPEG documents can be attached within G-Invoicing. If the agency’s administrator would like to control which file types may be attached to reports, they can navigate to the Disburser Admin module and configure which document types can be attached. Why is there additional information at the GT&C level (i.e. scope, roles and responsibilities, restrictions)? Information is captured for both the requesting and servicing agencies both agencies have all the information that is needed to be able to reach the agreement. Some information is optional, agencies have the option to include this information if known. Are there going to be new data elements for the G-Invoicing solution, which agencies will have to input into the new system? Through efforts of the Intragovernmental Transactions Working Group (ITWG), data elements have been defined for the GT&C and Orders with standard definitions and data type requirements. These are now available in the “Functional/Operations” section of the G-Invoicing homepage, along with the Fiscal Service Data Registry link located under the References section. For additional information, please visit the Fiscal Service Data Registry at: https://www.transparency.treasury.gov/dataset/data-registry. I forgot my password. How do I get my password reset in G-Invoicing? On the log on page there is an option to reset your password under the User ID/Password fields, or contact Treasury Support Center at e-mail: GInvoicing@stls.frb.org and/or phone: (877)-440-9476, Monday – Friday, 7:00am - 8:00pm EST. Always be clear about the environment in which you need the password reset QA or Production. My User ID / password is the correct information but I cannot login. If a user has not logged into G-Invoicing for 90 days after their initial addition to the system, the account will be deleted within G-Invoicing. If the user needs access to the system after being deleted, a new User ID must be created, and they will have to log in to activate the new User ID within 90 days of the issue date. Contact your agency’s G-Invoicing Users Administrator and/or the Treasury Support Center at e-mail: GInvoicing@stls.frb.org and/or phone: (877)-440-9476. G-Invoicing (G-INV) provisions users through the Treasury User Provisioning System (UPS). When a new user is created or a password change is initiated, the incorrect URL is provided in the system generated e-mail. Please ensure the correct URL is displayed when attempting to login. This issue will be resolved in Release 2.2. I cannot set up a permanent password. The application is telling me the password does not meet minimum requirements. Passwords must be at least twelve (12) characters in length with a minimum of 1 upper case letter, 1 lower case letter, 1 number and 1 special character. Passwords cannot have two repeating characters; cannot be a word in a language, slang, dialect, or jargon; and cannot be related to personal identity, history, environment or other personal associations. The new password cannot be one of the last 10 you’ve used.